How familiar does this sound: you’re looking for a new game and come across something that looks pretty cool … and it’s free! What a find! But then, as you’re playing, you get some interesting suggestions: “Buy crystals to unlock special skins!” “Buy the Wind Raker DLC pack to turn into a cat dragon!” “Pay $99.99 to get these three characters and a pack of supplies!” That last one sounds extreme, but I’m looking at it right now on my favorite phone game. It’s these moments that clue us into the notion that maybe our new game isn’t as free as we’d thought it would be. From some perspectives, a business model relying on low-upfront cost with in-game purchases is dishonest. Others enjoy that they can limit their spending to what they know they want, treating the free version of games as a demo. Then, for one very specific group, it’s sometimes a necessity to make the continued support of a product possible. That group is made up of primarily game developers. You know, like us. Because of the nature of the games industry, it would have been irresponsible of us not to at least consider this option. As always though, when considering something about Gears of Eden, we like to ask the community about it! Looking at the results pictured at the top of this article, it’s pretty clear what the message is in our most lopsided poll ever! Some of you are open to the notion of games funding themselves through DLC or in-game purchases, but the vast majority of you, at very least, want to be able to just pay once and have the whole game. And you know what? We agree with you! Don’t get me wrong, I love a good expansion pack (The Frozen Throne, anyone? Sims 2: Pets??? ), but I’ll take a single upfront cost over a bunch of smaller purchases every time. That said, I don’t necessarily disparage developers who adopt the IAP business model. When I look at Star Citizen, I see a very big, very cool game … that would not draw an audience large enough to pay off its cost of development at a standard $60 price tag. Of course, right now, we are at a very early stage and looking for ways to raise funds to expand Gears of Eden past our first demo stage. We don’t have the luxury of being an established studio with investors and funds to launch a full game project and then charge a fixed price upon completion. 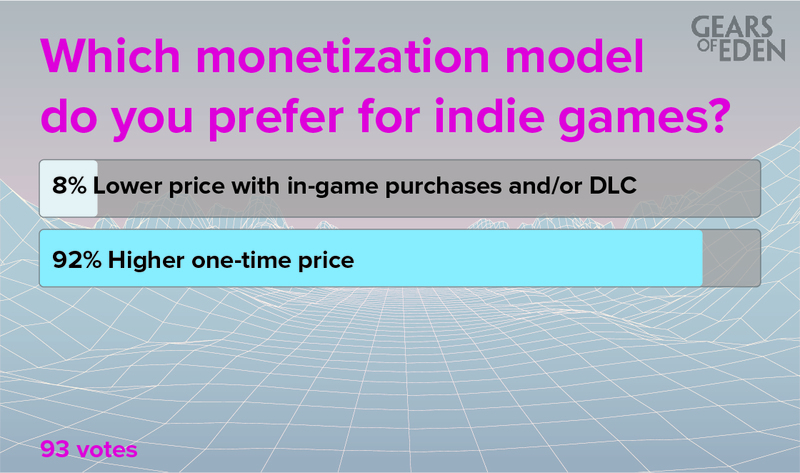 What we’d like to do, is allow potential players, like yourself, to get their hands on our demo, and then decide if they’d like to back us to expand that demo toward a full game through a one-time cost that gives you access to the full game, keeping in-game monetization features to a minimum, for real expansions or to offer a wider range of cosmetic upgrades. Most importantly though, we’ll never put you in a position where you need to choose between mind numbing grinds or paying some amount of money to progress. That’s all for this week’s Fan Feedback! We’ll be back next week with a new poll (we’ve given the poll a couple weeks off for the holidays). As always, if you have suggestions on a poll topic, just let us know in the comments or on Twitter! Thank you for a wonderful 2016, we aim to make 2017 even better! As always, if you want to keep up with all things Gears of Eden, be sure to follow us on Twitter and Facebook! And, if you’d like to be entered into the drawing for a key to our upcoming Alpha build, sign up for our newsletter! Thanks for reading and I hope you have a wonderful rest of your day!